My search for the perfect Turkish Delight fragrance has been a bit of a nightmare. I am a huge fan of the middle eastern treat, its powdery soft texture and sweet taste are irresistible to me and long have I looked for a fragrance that perfectly replicated everything I loved about the delicacy. I have tried all of the Turkish Delight/Loukhoum perfumes to no avail, they all seem to focus on a hideous burned cherry dessert rather than my favourite treat. After years of searching I came across a sample of Traversée du Bosphore soon after it was released and for me it is the perfect Turkish Delight fragrance. 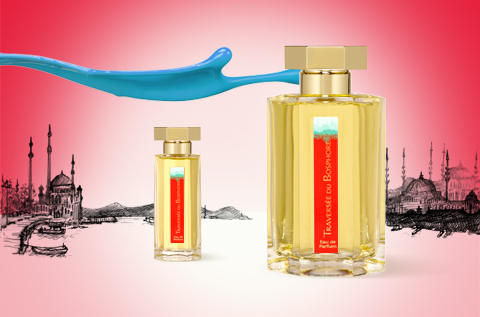 Traversée du Bosphore was released in 2010 and is inspired by Bertrand Duchaufour’s trip to Istanbul and his crossing of the Bosphorus, where Europe meets Asia. It opens with a strong blast of sweet apple, which is mouthwatering and crisp. The golden spice of saffron tempers the sweetness of the apple and adds a slight tinge of something sour and metallic. The Turkish Delight in Traversée du Bosphore is of two varieties; rose and pistachio. Both of which are my absolute favourite flavours (I’m starting to think this fragrance was made for me) and the blend of the rose, which is very much like rose water here, and the nutty pistachio is simply heavenly. It wouldn’t be a Duchaufour creation if there wasn’t some smoke and woods lurking in the background and they are definitely there, but their use in Traversée du Bosphore is much more subdued than in most other Duchaufour fragrances. Leather is listed as a note, but thanks to a generous whack of iris the affect is closer to that of suede than leather. The suede like texture laid underneath the sweet apple and Turkish Delight with the wood and smoke in the background, makes for a rather delightful, yet interesting composition. Traversée du Bosphore feels like it is slowly unfurling on your skin, and as each layer is peeled away a new surprise appears. Traversée du Bosphore has very quickly become one of my absolute favourite fragrances, it wears relatively close to the skin and it definitely treads the line of unisex. I would recommend it to anyone, but it is one of those fragrances that you will either like or you won’t, if you’re not a lover of gourmand fragrances then it really is a must try, it offers something completely different within an overcrowded genre. It struck me a while ago that I didn’t have a ‘vanilla’ in my collection, I have a good few fragrances with vanilla, and even some that showcase a vanilla note, but none that could take the place as my ‘token vanilla’. Discovery of this fact left me quite puzzled – I like gourmands, I like vanilla, so why the distinct lack of a reference vanilla within my collection? For that question I don’t have an answer but I think I have found a vanilla to remedy the void within my collection, a vanilla that I’m tempted to refer to as the ‘perfect vanilla’ – and that is Vanille Absolument. Although, if there is one thing I have learned during my perfumista discovery is that you should never speak too soon! 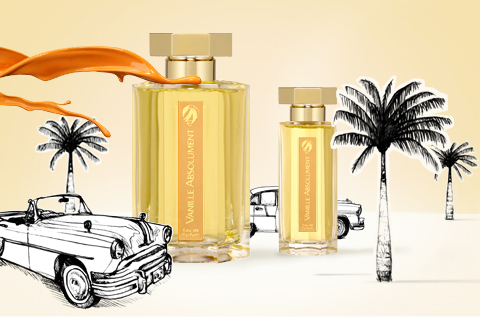 Vanille Absolument, formerly named Havana Vanille, was released in 2009 and is inspired by the sights, sounds and smells of Cuba. It opens with a melange of notes; cloves, cinnamon, dried fruits and rum, LOTS of rum, so much rum in fact that I’m sure Jack Sparrow would love this fragrance. But the rum is where the connotations with Cuba end. As you would expect the vanilla comes through very quickly, there is a brief moment of discord between the rum and vanilla before the two notes decide to work together in harmony. Vanille Absolument is quite similar to Guerlain’s Spiritueuse Double Vanille, but it’s about 10 times lighter, the rum, whilst boozy, gives the vanilla an almost sheer quality that is much easier to digest than the Guerlain. Vanille Absolument becomes drier and smokier as it dries down, there seems to be a good deal of incense and benzoin within the base that adds a woody fuzzy facet, a facet that works perfectly with the vanilla. The woods never quite take over and it very much feels like a perfect pairing for the creamy tones of the vanilla. Bertrand Duchaufour has created yet another fragrance that displays his talent for taking the trite and the familiar and turning on it’s head. Vanille Absolument may not be the best vanilla in the word, but it is the best that I have tried, maybe one day another vanilla will come along and take it’s place, but for now it remains for me a really wonderful discovery. Both Traversée du Bosphore and Vanille Absolument are available in 50ml and 100ml Eau de Parfum. Prices range from £65-£88. This review is based on bottles of Traversée du Bosphore and Vanille Absolument from my own collection. Posted in Gourmand, L'Artisan Parfumeur, Perfume Reviews and tagged Bertrand Duchaufour, Havana Vanille, L'Artisan Parfumeur, Les Voyages Exotiques, Traversée du Bosphore, Turkish Delight, Vanilla, Vanille Absolument. Bookmark the permalink. I very much like the sound of that L’Artisan Trifecta! I echo that I think you will really enjoy Safran Troublant, CPB. I just got a bottle, and it is the only 100 ml bottle I own, because I can really see this becoming a signature scent. Signature scent?! Now that’s serious business, I shall have to give it a try! Turkish Delight is perhaps the best thing on Earth. Do you get the chocolate bar ‘Fry’s Turkish Delight’ in Austria? It’s heaven! I like TdB but I think I enjoy it more as a candle than as a perfume to wear. Also, I wanted to make sure your readers know that if they want to buy Vanille Absolument from the l’Artisan website, it is on sale right now, at least on the U.S. site – I don’t know if the U.K. sale is still on. That is correct, thank you for mentioning that! I even picked up a bottle in the sale on Monday and forgot to mention it! Really? That’s interesting, I thought it would be quite easy to find in the US, it’s a shame that it’s not! I’m glad you have Traversée du Bosphore to give you your Turkish Delight fix! I absolutely agree, and TdB is also my favourite “Turkish Delight” frag. It really is lovely and is exactly what I’d want from a “Turkish Delight” frag, where others of the ilk tend more towards “too-much-of-a-good-thing”. However, “Vanille Absolument” unfortunatey did ‘absolument’ nothing for me as a “vanilla”. It starts off quite promising, but then turns horribly “soapy” on me, which just totally destroys my enjoyment of it. … The two that do “do it” for me, which I much prefer are : Micallef’s “Note Vanillee” (which is sort of in the same vein as VA/HV, but IMO far superior). Felanilla is absolutely awesome, a great Shalimar-like vanilla. I have to say that none of the Micallef’s do it for me at all, which is a shame, they seem to be very popular. Oddly enough, I’m actually in accord, none of the other Micallef’s do much for me either, Note Vanillee is the ONLY one I like. And the boozy/smokey vanilla in it, is probably the best I’ve encountered in any perfume, including even Guerlain. (Delicious and very true “woody/pod” like.) It’s everything I wanted from SDV, but didn’t quite get. ~ By the way, do you get any “soapy” notes from VAbsolument, or is it just me ?? I really don’t know where I stand with SDV, I really like it when I try it but just not enough to buy it, I don’t think the £150 price tag helps. I do get some soapiness in the beginning, I think that’s possibly the discord between the rum and vanilla that I mentioned. I don’t mind a heavy vanilla, I just don’t want it to be cloying or syrupy. Well, I didn’t know Havana Vanille had been renamed, so thanks for putting me straight on that! Why do you suppose they changed the name? Something to do with the Cuba reference, maybe? Anyway, I am sorry to say that both of these are heavy on me, and sort of fuzzy and rich, not in a good way. I have tried both repeatedly, but they just don’t like my skin. The reviews are largely positive though like yours, especially of Traversee, so I am sure it must be me. You do describe them in a very luscious way though, so I can enjoy them virtually instead! I think it’s something to do with a copyright infringement? There didn’t seem to be much information available. I think that ‘Vanille Absolument’ is a better name anyway, I know it doesn’t fit with the travel theme but the links with Cuba aren’t strong enough to be linked. I can see why they might be too heavy for you, Traversée is especially cloying (in a powdery way) if you’re not a fan! I actually ordered Traversee du Bosphore blind for my other half this Christmas. Thankfully he loved it. When I sniffed it, I was really dissapointed. I bought it due to the constant references to turkish delight, I just didn’t find it in here! I really wanted a powdery rose with strong nutty notes over leather and it sounded so ideal. I prefer it late into the drydown, but I could unfortunately never wear this myself. It’s nice to see it recieving some great praise though, this one goes unnoticed quite a lot. I’m sorry to hear that Traversée du Bosphore wasn’t quite the Turkish Delight scent you were looking for, I am glad to hear that your partner likes it though. I don’t get the soiled underwear at all, I will have to re-test it when I get home. Maybe the Keiko Mecheri Loukhoum scents would be more up your street? Hi there. I have recently discovered your fab blog as I have decided to ‘educate’ myself in the perfume world! 🙂 I recently got samples from Scent and Sensibility – Loretta – WOW – and it rocks, but think I am looking out for the perfect vanilla. How would I test/find a place to smell L’Artisan Parfumer perfumes? I really want to try this one! The best thing to do is to go on their website () and check their list of stockists. Failing that you can always order samples from Luckyscent. My favourite perfume house! Thanks for the marvellous review! Love the rum note in Vanille Absolument. Cute progression from the ice-cream froth of the vanilla. This scent takes me to Ibiza and back. It’s just delicious in every way. I’ll have to visit Ibiza if it smells like VA!